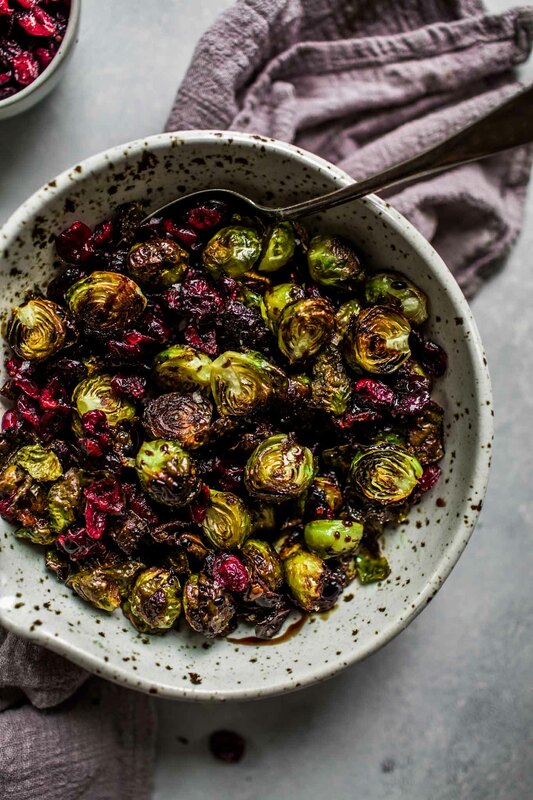 Roasted Brussels Sprouts with Balsamic Reduction & Cranberries make a simple and elegant side dish that both kids and adults love! Brussels sprouts get a bit of a bad rap. 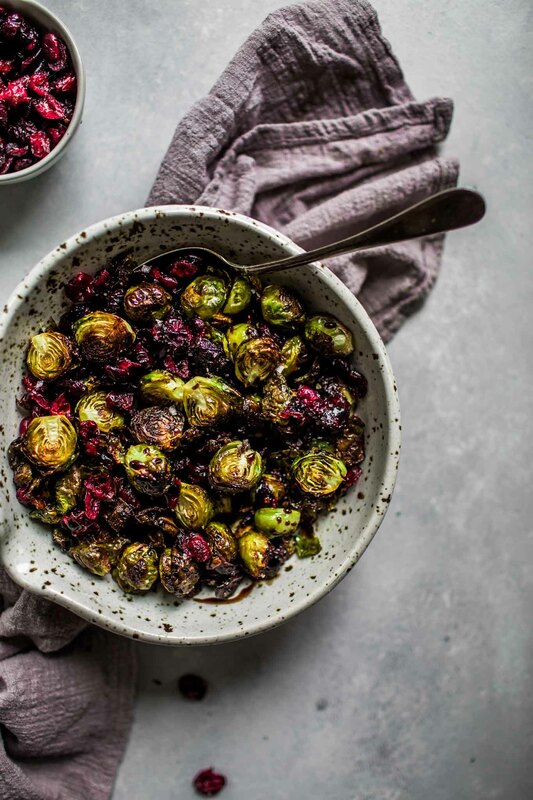 These brussels sprouts are roasted until nice a crunchy and then topped with tart cranberries and a sweet, balsamic reduction. My favorite part of these roasted brussels sprouts is the little leaves that fall off and get super browned and crispy, they’re almost like little potato chips! Plus, just look at how pretty this dish is. I promise it tastes as good as it looks. Give it a chance at your holiday table for Thanksgiving or Christmas. I have served it to kids and adults and everyone ends up loving this dish! If you can believe it or not, kids actually ask me to make this recipe over and over again. Roast brussels sprouts in a 350-degree oven for 35 minutes. Roast brussels sprouts in a 375-degree oven for 30-35 minutes. Roast brussels sprouts in a 400-degree oven for 25-30 minutes. Roast brussels sprouts in a 425-degree oven for 25 minutes. Roast brussels sprouts in a 450-degree oven for 20-25 minutes. Roasting brussels sprouts at a high temperature ensures that they are crispy. I prefer to roast them at 400-degrees or above based on the cooking chart above. 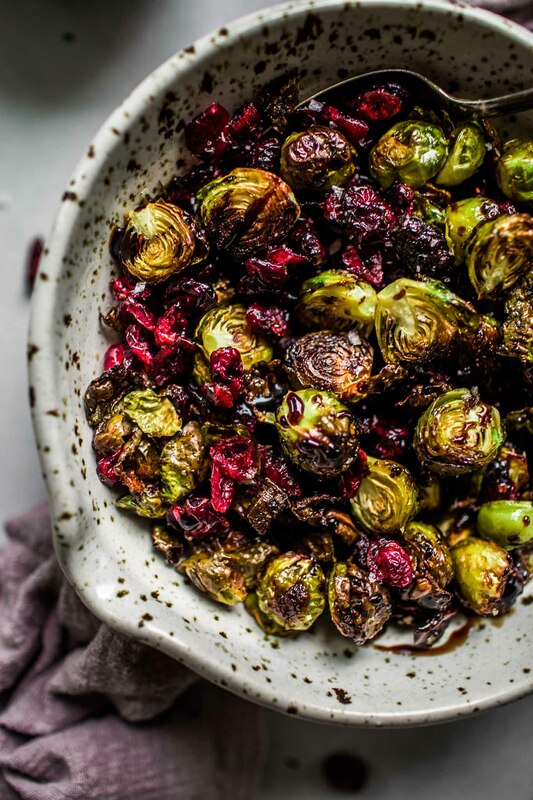 How Do You Make Balsamic Glazed Brussels Sprouts? To make the balsamic reduction that I use to coat these brussels sprouts, I reduce some balsamic vinegar with brown sugar. Bring 1 cup brown sugar and 3/4 cup balsamic vinegar to a boil and then let it reduce until it becomes thick and syrupy. This will take about 20 minutes. Be sure to keep an eye on it and don’t let it reduce too much, or it will become one solid mass, like hard candy. 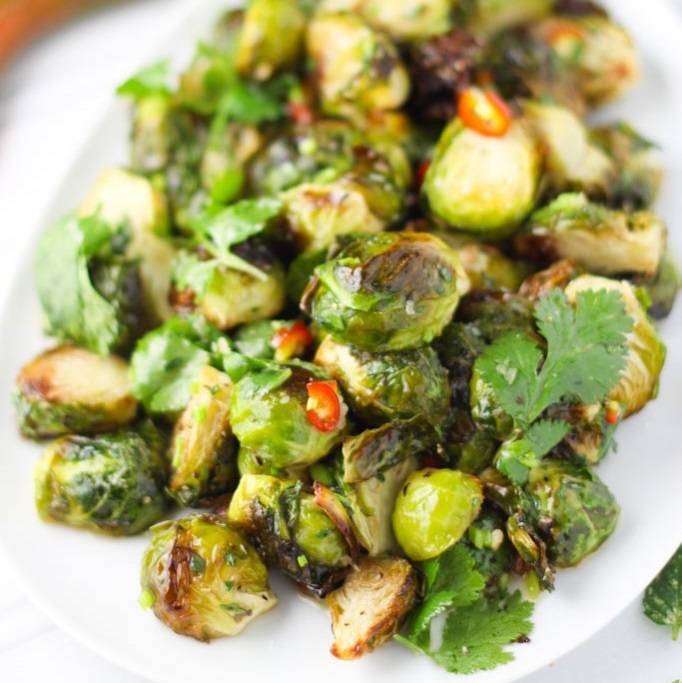 What are Some Good Dishes to Serve with Brussels Sprouts? These roasted brussels sprouts make a great side dish for holiday dinners like roasted turkey or ham. Or, try serving them with these Pork Chops with Cherry Sauce, Easy Roasted Chicken, One Skillet Chicken with White Wine & Mustard Cream Sauce, or Red Wine Braised Beef Short Ribs. If you loved these Roasted Brussels Sprouts with Balsamic I would appreciate it so much if you would give this recipe a star review! Also, be sure to snap a picture of your finished dish and share it with me on Instagram using the hashtag #platingsandpairings and tagging me @platingsandpairings. 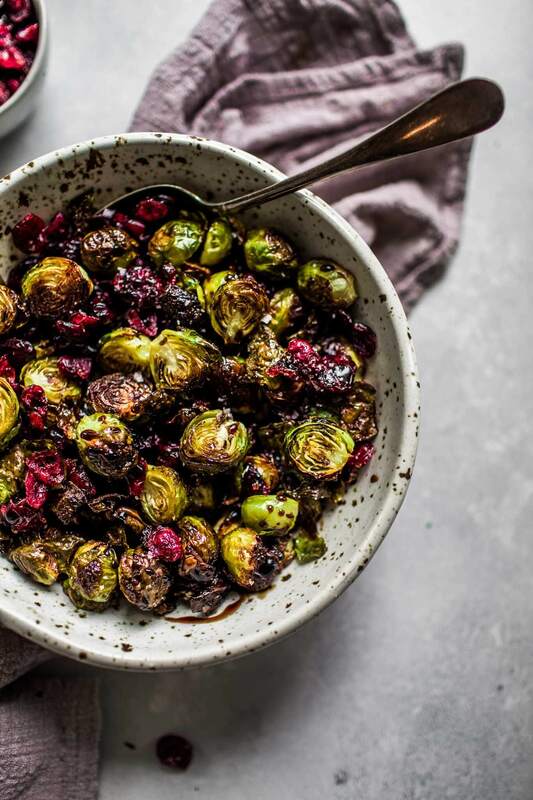 These Roasted Brussels Sprouts with Balsamic Reduction & Cranberries make a simple and elegant side dish that both kids and adults love! Cut off the brown ends of the Brussels sprouts and cut in half. Mix them in a bowl with the olive oil. Pour them on two baking sheets and roast for 25-30 minutes, until crisp on the outside and tender on the inside. Meanwhile, combine the balsamic vinegar and brown sugar in a saucepan. Bring to a boil, then reduce the heat to medium-low and simmer until glaze is thick and syrupy, about 20 minutes. 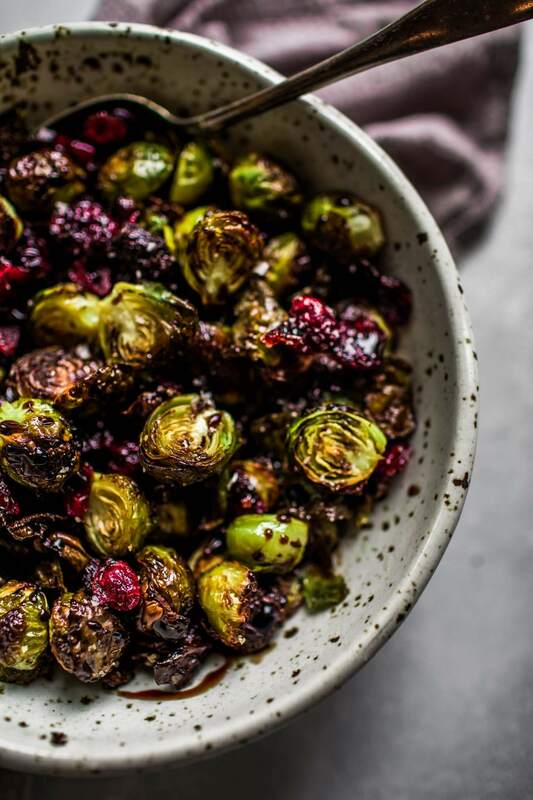 Drizzle the balsamic reduction over the roasted sprouts. Sprinkle with dried cranberries and serve immediately. 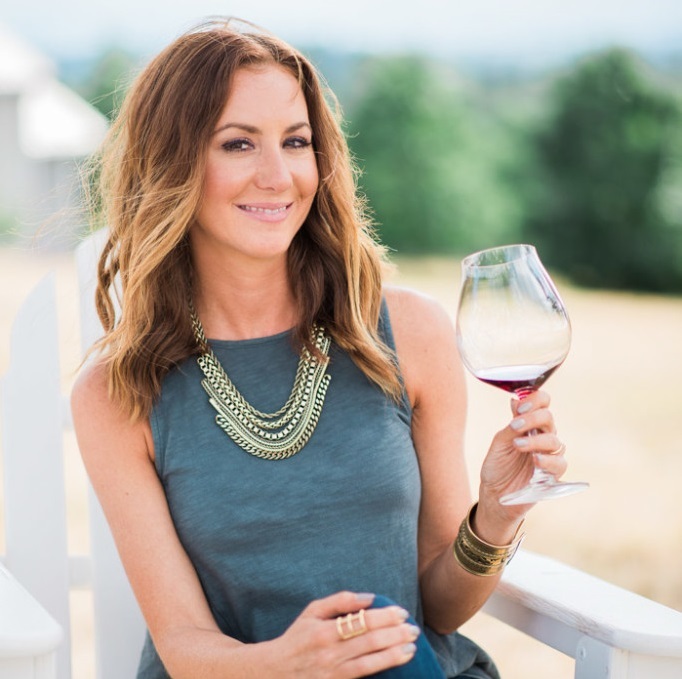 A light Pinot Noir with bright acidity, cherry notes and earthy notes will compliment the flavors in these Brussels sprouts nicely. Line your baking sheets with parchment paper or tin foil for easy clean up. 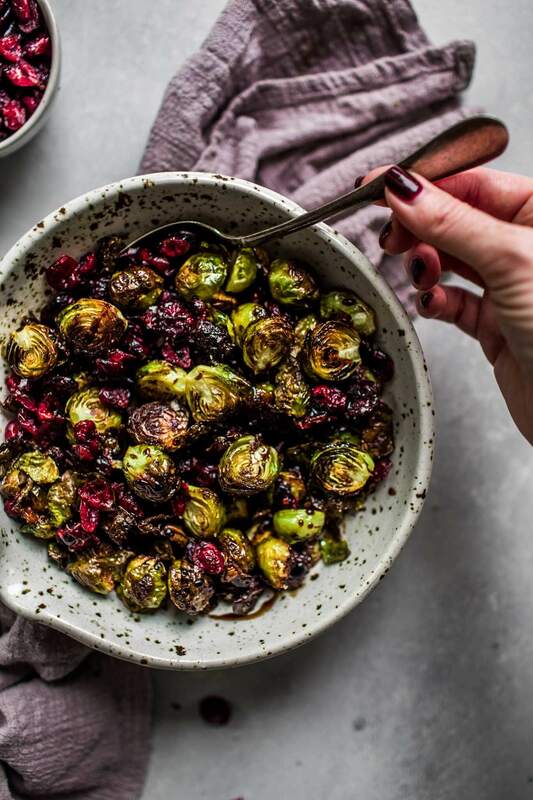 Watch me make these Roasted Brussels Sprouts with Balsamic on the news! Beautiful presentation! Live from Pacific city, Oregon. The flavor is delicious; however, I do not recommend cooking until very thick. I recommend cooking until it starts to thicken. I cooked until very thick as the recipe stated, and 5 minutes after drizzling over the vegetables, it hardened and we were unable to eat it. I agree Stephanie. As I mentioned in my tips, the sauce can harden quickly. I’ve revised the recipe slightly. Thank you for the feedback! It hardens because the sugar in it cooks into hard candy. (its the ratio of sugar & liquid. ) If you want to insure you wont have hard candy, use a thermometer, and cook it to slightly under soft-ball stage.. dropping some as it ribbons off a spoon, into some ice water, will show you immediately how hard/soft it will be. Rebecca – It’s definitely a good idea to drizzle the balsamic sauce immediately after heating it – Otherwise it definitely hardens up. Thanks for this helpful tip! 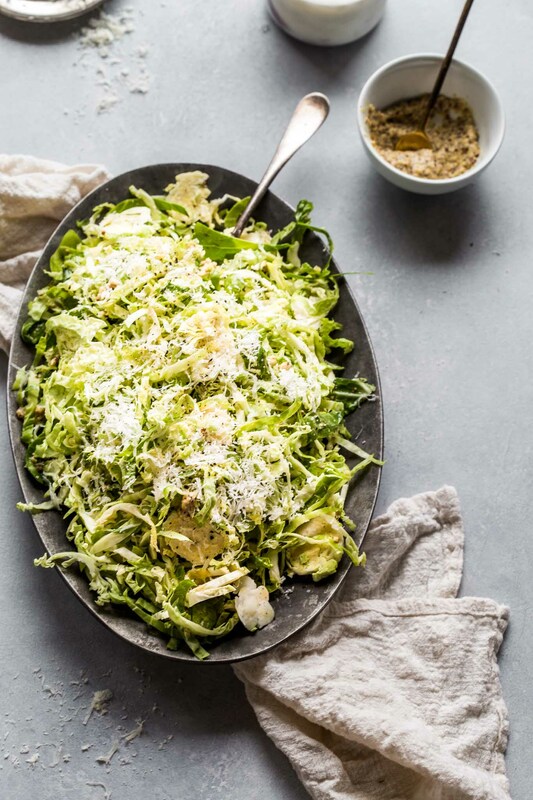 Love this and have converted brussels sprouts haters into lovers with a dish very similar to this. Here’s another thing to try – sub in pomegranate molasses (a reduction of pomegranate juice) for the balsamic glaze. You’ll love it! Sounds great Beth! I think I have some pomegranate molasses leftover in my cupboard from this recipe. My kids love brussels sprouts! I hated them growing up, but my mom always boiled them. My father in law cooked them all the time and he roasted them…what a difference! Now I make them all the time too. But I usually stick with a plain jane version. I need to try yours! I grew up eating them boiled too… SO yucky 🙁 But kids LOVE this version – Promise! To make a reduction that doesn’t harden to candy, simply add a fat! Add butter and the fat will stop the sugar from hardening. Hi Bridget – You can definitely use fresh cranberries. I would toss them together with the brussels sprouts and roast them together to soften them up and sweeten their flavor. Hope this helps. Happy Thanksgiving! So glad I read this thread. Mine are cooking now. I added orange zest to mine. I made these for Thanksgiving and everyone love them. I read the comments about the sauce solidifying, so what I did was add a little dash of Cream of Tartar to prevent hardening of the sauce. It worked as I had some leftover sauce sitting in my pan and it was still liquid. Thanks for the recipe. I will be making these for Christmas Eve for my husband’s family. Any thoughts on a sugar substitute? Hi Maggie – I have not tried it yet, but you should be able to swap out the sugar for honey or maple syrup in this recipe. Both would be delicious! Hey! My boyfriend and I are making this this weekend, and he doesn’t like things with a lot of sugar. I saw the suggestion to substitute honey or syrup; would the instructions for making the glaze be different then? Sorry if it’s a dumb question; I’m still a bit of a cooking novice. 😀 Anyway, this looks delicious! Can’t wait to try it! Hi Laura – I would maybe make the glaze as is, but just add less of it to his portion. You can just drizzle it over the sprouts once they’re served up. Hope this helps! Wow brussel sprouts have never looked so appetizing! I might have to try this recipe. My husband isn’t a big fan of many vegetables but I’m sure that he would be hard pressed to turn down a dish this delicious. I swear that even kids love this recipe Kelsey! Roasting is definitely the way to go I think! Yes, roasting brussels sprouts is the best preparation for them!!! 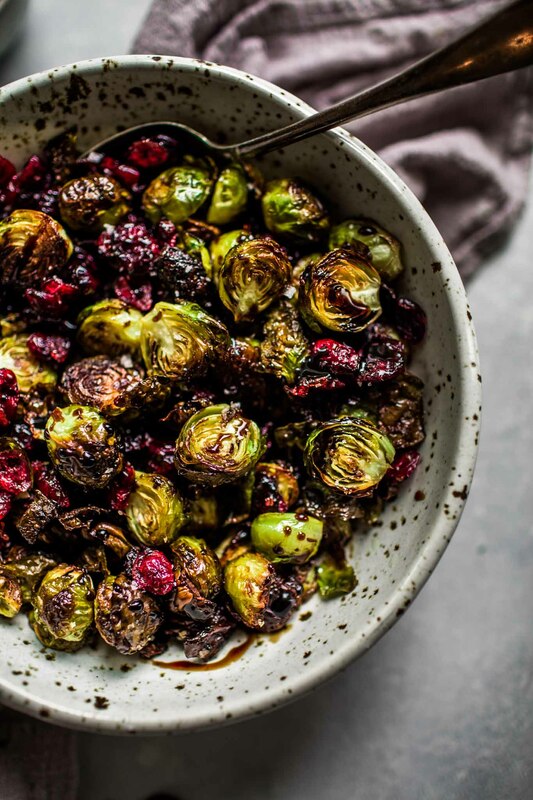 Roasting brings out all the goodness of Brussels sprouts! I love the addition of cranberries here – both for the flavor pop and the color. Beautifully presented, as always, Erin. 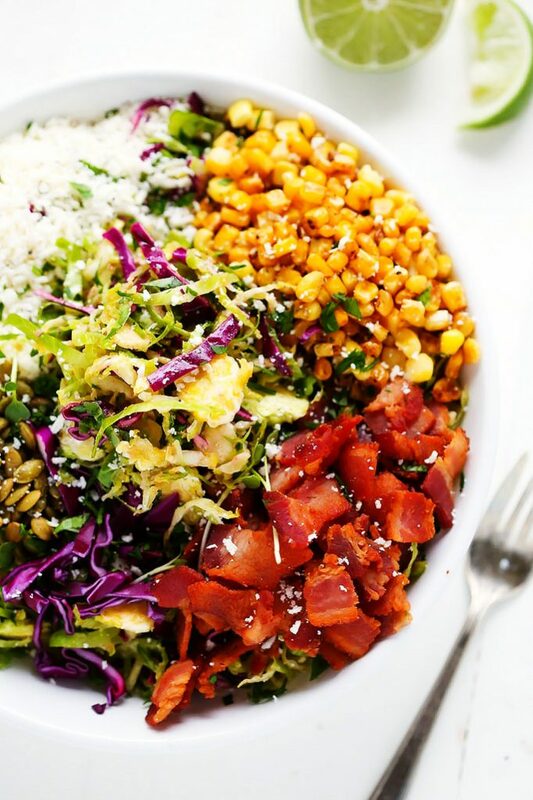 This is my kinda side dish!! Looks amazing! It’s definitely a hit in our house Karly!